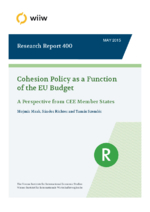 This study analyses the key patterns of cohesion policy within the overall framework of the EU budget, viewed from the perspective of the new Member States of Central and Eastern Europe. In more specific terms, the main objectives are, first, to analyse past trends of cohesion policy and the attitude of various groups of countries towards this policy; second, to assess the position of cohesion policy within the 2014-2020 medium-term financial framework of the EU; and third, to discuss alternative options for cohesion policy within the framework of the EU budget in the post-2020 period. In methodological terms, the conceptual parts are based primarily on a qualitative analysis of the literature while empirical inputs were provided first of all through an expert questionnaire survey and country case studies. The research results convey the important message that the feasibility of scenarios other than maintaining the ‘status quo’ will most probably not depend on the behaviour of the new Member States. Despite their strong and explicit interest in securing ample resources from cohesion policy funds for themselves, the new Member States’ administrative and academic experts with their non-negligible influence on the political decisions of their governments cannot be seen as a stumbling block in the way towards reforms for a modernised and more rule-based EU budget. A resolute shift towards increased EU budgetary support for projects with more European value added and stronger future orientation than today, and a fair and transparent distribution of net financial positions will be far more determined by the outcome of multifaceted interest reconciliation among the ‘major players’ of the ‘old’ EU-15.